I think adventure maps could provide a lot more detail to help game masters run their games. Here is an example of what I mean using the classic Caves of Chaos from Keep on the Boarderlands (1979). There are many different purposes for maps, and a cartographer will try and design a map with that purpose in mind. When making cartographic decisions about scale, level of generalization, symbols, media, foreground and background, and host of others, he or she makes decisions that help achieve the map’s purpose. This is also true for maps in RPGs. There are two broad groups of maps – the reference map and the thematic map – that most maps can be categorized as. Two other purposes for maps in RPGs are also included here – the battle map, and maps used primarily as art. Maps used for reference are general purpose location maps. They are used to illustrate the geographic relationships between features. Design decisions are based on the relative importance or size of a phenomenon, with enough geographic context to place those phenomenon in space. The scale of the map influences how much other detail and how many kinds of features are included. 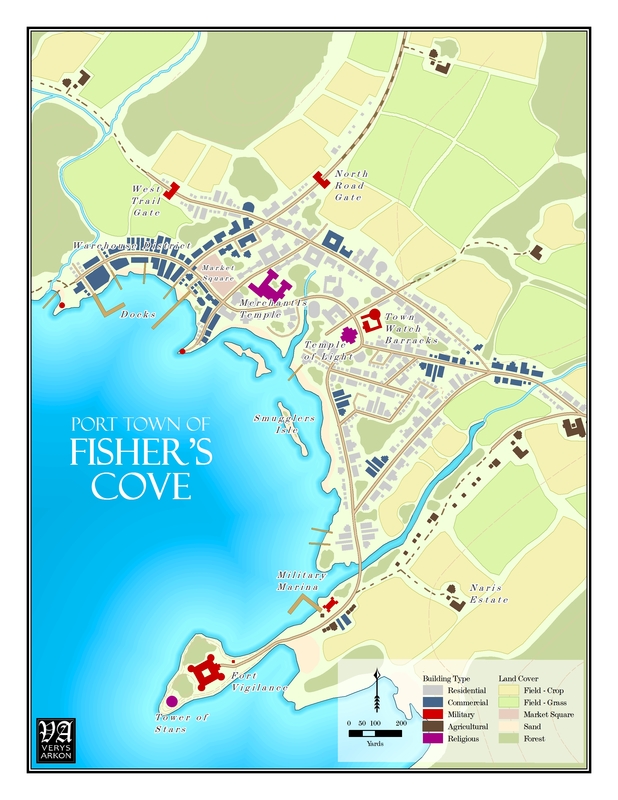 A typical reference map in an RPG is the setting map. It can be very small scaled, to show the entire planet, or large-scaled to show an individual village. It usually shows basic natural features like hydrography and topography, such as lakes, rivers, mountains, and cliffs. It also typically shows vegetation cover, such as forests and swamps. Anthropogenic features such as settlements and transportation routes are common. The main purpose is to show ‘things’ in relation to each other. Where are ‘things’? What is nearby or far away? How are things connected in space? In RPGs, phenomenon selected to be mapped typically relate to where adventures may take place, where there are ‘safe’ areas, and what lies between that needs to be traveled across. A road through dangerous woods full of spiders, a mountain range to be crossed, a volcano serving as the red dragon’s lair, or the port city where passage on a ship can be purchased. An adventure location key map, like a dungeon or city map, is a kind of reference map. It shows where the rooms are, the corridors that connect the rooms, and where stairs and traps are. These maps have a specific message to relate to the reader, and I find are actually fairly rare in RPG publications, though not unheard of. Cartographers select symbols to emphasize a particular theme or message, and de-emphasize unrelated phenomenon. Base features are kept simple and in the background, to not draw attention away from the message of the map. An example would be a map of the world showing where goods are produced, and the trade routes that those goods flow through. Thematic maps are a great way of describing the world in a focused way that is more efficient at communicating spatial relationships than blocks of text. A series of thematic maps, atlas style, can really breath life into a world. However, with their focused message they are less useful for all-around general purpose reference. With page space at a premium, and the additional cost, it is understandable why thematic maps are not as common in RPGs. These are fairly particular to table-top gaming. Commonly at 1″ to 5′ and gridded to facilitate the use of miniatures, they are some of the largest scaled maps out there. They usually only show the contents of a few rooms or a key adventure location, and are often printed on poster-sized paper or cardboard tiles. Battle maps are used along with miniatures to track the relationship between adventurers and their foes with very high precision. Ranges of weapons, movement of critters, and the size of a fireball are all easily discernible without the vagaries of Theater-of-the-Mind. They are also often very illustrative, with textured stone, light and shadows, columns, furniture, windows and doors. They are evocative and artistic to help players visualize their surroundings. The use of Battle Maps is a personal preference, and a topic for another day. The last purpose I want to touch on is the use of maps in RPGs as art. There are some very talented illustrators producing beautiful maps in RPGs today, and without a doubt they help to convey the feel of a world. The use of colour, shape, and texture woven together by an artist in a (sometimes literally) painterly fashion can invoke mood, curiosity, wonder and host of other emotions. Artists producing maps in an illustrative style make cartographic decisions differently than a cartographer producing a reference or thematic map, because the purpose of the map is somewhat different. Individual artistic styles result in a spectrum of maps that emphasize utility or beauty, with the best somewhere in between. Reference: Forgotten Realms World Map ©Wizards of the Coast. This site is new, and more content will be added shortly. For now, just an introduction. I’ve started this site to share my passion for maps of places that don’t really exist. I’m going to be looking at maps from RPGs (then-and-now), historical maps, spotlighting various fantasy cartographers, linking to other resources, talking about cartography, and sharing some of my own work.